Saturday morning with bottomless drinks, all you can eat food, music, and a great view? Sign me up! If you’re looking for a great way to spend a lazy Saturday morning in Cartagena, why not check out Townhouses’s Boozy Brunch? Read on for a complete rundown and review of Townhouse’s Boozy Brunch, held every Saturday. 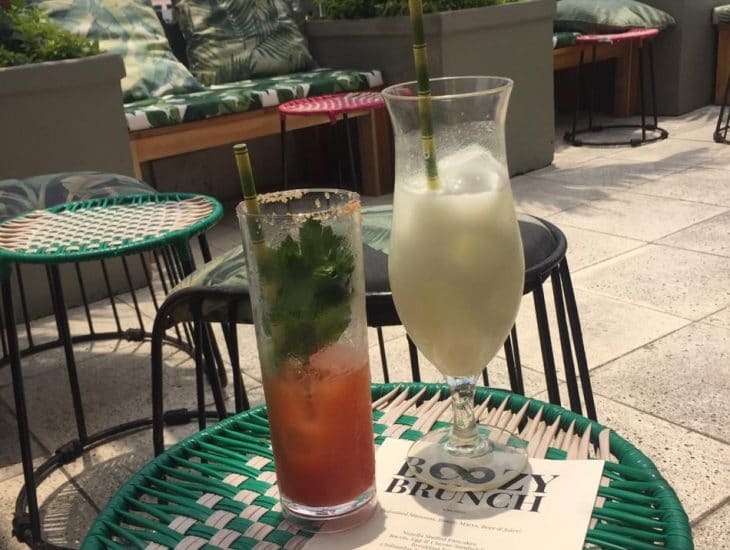 Read on to see if the Townhouse Boozy Brunch is worth it. Say what? That’s right, this brunch features all you can eat and drink and is held every Saturday. Located in the heart of Cartagena’s Historic Walled City, Townhouse Boutique Hotel is one of the few places that offers a true brunch in Cartagena, and the only one to offer an unlimited one. In addition to bloody marys and mimosas (both rarities in Cartagena), there’s also a DJ on hand. All of that at their rooftop bar with great views. 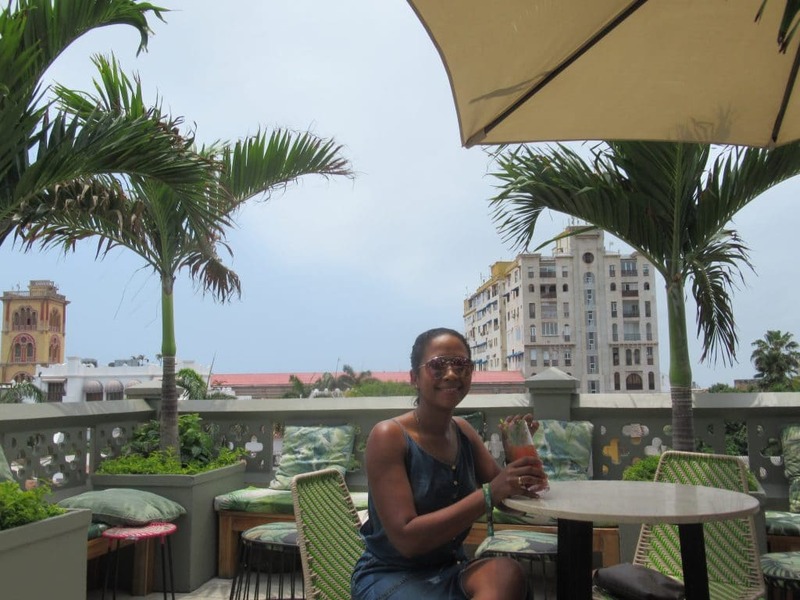 The rooftop bar at Townhouse Cartagena. I’ll be honest, 100,000 pesos seems steep, but my wife Susana and I decided we wanted to try it. We’ve gone to Townhouse for evening drinks before and they serve up some neat cocktail concoctions, have great tapas, and have a cool vibe. 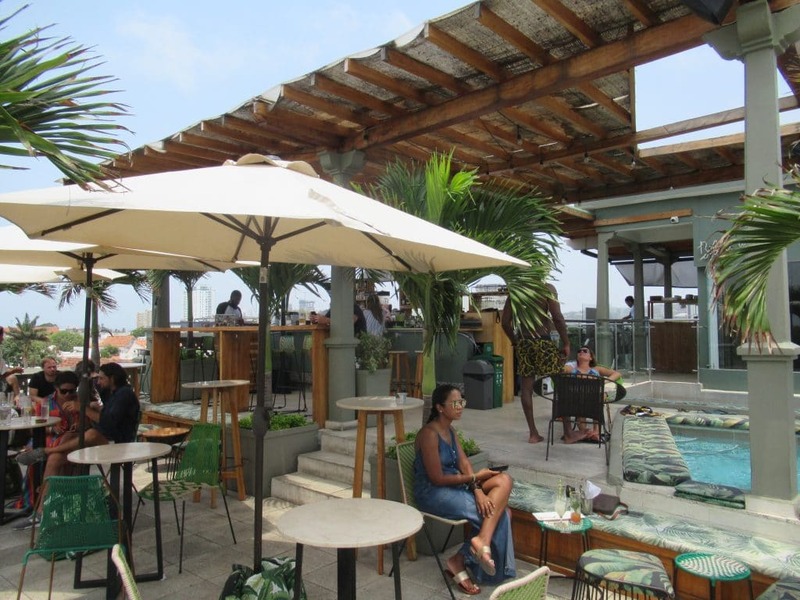 It’s definitely one of the coolest rooftop bars in all of Cartagena. So, we decided to give it a go on a recent Saturday when we had nothing to do. Susana was actually nursing a bit of a cold so opted against drinking and just ordered from the normal menu. I, on the other hand, decided to go for it. I started with a bloody mary and was pleasantly surprised. They are not a very common sight in Cartagena, which given the heat I guess is understandable, but but back home in South Carolina, having bloody marys with brunch is a staple. While it’s no SC bartender made secret recipe, it was pretty solid with even some spicy red pepper salt on the glass. Also, despite the all you can drink, it was not weak, in fact I’d say it was even a bit on the strong side. So far, so good. I also had several mimosas. Granted, a mimosa is pretty hard to screw up, but it’s still refreshing (pun intended) to have one here in Cartagena. Susana had a couple limonada de cocos (coconut limeade) and they were solid as well, so I’m sure all the juices are terrific (and I’m pretty sure you can order them with liquor as well). Susana did take a few sips of my bloody mary to go along with the view. I went first for the bacon, egg, and cheese sandwich. I love some bacon, egg, and cheeses. The plate comes as two sliders. While I guess I wish they were served on biscuits instead of mini-hamburger buns (or even better yet as sausage, egg, and cheeses and a side of grits), they were good. I also tried the chilaquilas rojas with pulled pork. The pork was delicious, very moist and flavorful. The nachos are covered in a sweet, semi-spicy red sauce, which was good but made it a bit hard to scoop up the pork piled in the center. Still, a unique and tasty dish for Cartagena. As 3 o’clock was approaching and I had lost count of how many mimosas I had enjoyed, I decided I had to take advantage and get one more food item (don’t judge, they’re tapas). After a considerable debate between trying the apple french toast or repeating the bacon, egg, and cheeses, I couldn’t resist going for the sliders again. Susana ordered the blackened octopus served in red chili sauce, which is really terrific and the garlic shrimp ciabatta, also very good. Honestly, the food at Townhouse is very good and flavorful so even if you don’t come for brunch, it’s great for an evening snack with drinks. All the food we had at the Townhouse Boozy Brunch was tasty. Final Verdict – Is Townhouse’s Boozy Brunch Worth It? I say absolutely yes, with the caveat that you take full advantage of it. The reality is you’re not going to find bloody marys or mimosas for less than 15-20,000 pesos anywhere in Cartagena, Townhouse’s normal menu cocktails are 25,000, and the tapas are 30,000. So, some simply math tells us that if in 4 hours you will have 4 or more drinks and 2 or more tapas, you’re getting a good value. And, properly motivated, you can probably do a lot more damage than that in 4 hours. If you’re planning to make use of the small pool, then that’s just a bonus. That being said, if you’re looking for a standard breakfast or even a brunch with a drink or two because you have sight seeing to do, plans later in the day or evening, or really just anything you need to do later, then it’s probably not worth it. I mean, let’s be honest, most of us aren’t usually in a shape to do much after enjoying an open bar the next day, much less the same day. Townhouse’s Boozy Brunch is a great way to spend a lazy Saturday enjoying some good drinks, food, and vibes. It would especially be a lot of fun with a group of friends. 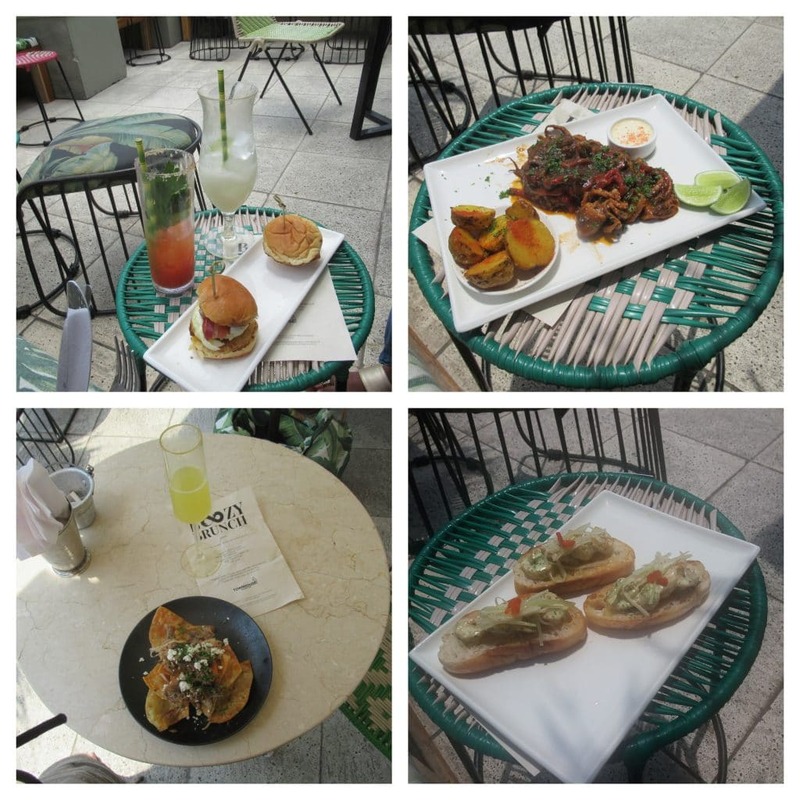 So, if you are visiting Cartagena and planning to have a lazy day relaxing anyway or, if like us, you live here in Cartagena and have a Saturday where you don’t need to be productive, then definitely check out the Boozy Brunch at Townhouse. One of Cartagena’s newer hotels, Townhouse has a chic, trendy, boutique style. It’s location is terrific, the rooms are very nice with a neat decor, and in addition to the sweet rooftop bar, there’s also a speakeasy piano bar. It’s one of our recommended places to stay in the Centro, and is one of Cartagena’s coolest hotels. Matter of fact, why not just stay at Townhouse? Check out their full cocktail and food menu at their website. Cheers and happy exploring (and boozing)! 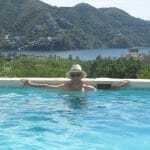 This entry was posted in Eats and Drinks and tagged Bar Reviews, Restaurant Reviews. Bookmark the permalink.